The Oude Doelenkade is the main street in the port of Hoorn in Northern Holland. Most of its warehouses, as well as many other buildings along the old harbour, were built during the seventeenth century. 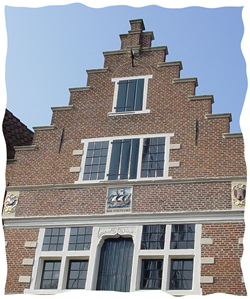 A large number of houses along that street have what the Dutch call Gevelsteenen (â€œgable-stonesâ€) in their facades. These stones usually have inscribed on them a motto, a date, or an allegorical figure whose main purpose was to publicize some information about the dwellers and/or characteristics of the building. In Number 21 of that street a curious gable-stone displays the image of a ship on the water, the inscription IN THE STRETSVARER (â€œsailing through the Straitsâ€), and the date 1618. By that time the Dutch had mastered trade in the Baltic, broken the Spanish and Portuguese monopolies in the Indian and Atlantic oceans, and started to display many of the practices that allowed them temporarily to dominate world trade. Another region where Dutch trade and shipping made its presence felt was beyond the Iberian Peninsula and the Straits of Gibraltar (the so-called straatvaart) in the Mediterranean. This aspect of Dutch trade has usually been regarded as a marginal topic among early modern historians, even for those whose main focus is Dutch economic history [â€¦]. In this site you will find information about the characteristics and evolution of Dutch Mediterranean trade between the end of the sixteenth and the beginning of the seventeenth century. The result of more than a decadeÂ of historical research and archival evidences on this topic will be presented in a totally new way to the academic and non-academic community.